It was the summer of 1918 and Belleau Wood, France. A brigade of US Marines was facing off against some five divisions of German soldiers. The fighting was fierce and the battle was bloody. But the Marines were gaining ground. Then came the order: “Take the hill.” And take the hill they did. Wearing gas masks to protect themselves from the mustard gas being flung at them by their German enemies, the Marines charged the hill, scrambling on all fours, with eyes that were bloodshot and sweating profusely from the summertime heat. 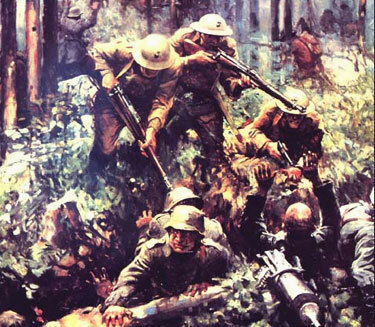 The German soldiers, seeing these grizzly Marines coming at them, are said to have yelled that they were being attacked by “teufel hunden,” poor German for “dogs from hell.” To this day, Marines still proudly tout the moniker “Devil Dog” as a tribute to their determination to “take the hill” in battle, no matter what. Hills are taken not only literally in battle, but also figuratively in life. One company may try to “take the hill” of another company in a hostile takeover. At a game, one football team will try to “take the hill” of another football team as it seeks gridiron glory. And what child hasn’t played “king of the hill” where he seeks to “take the hill” of another child? We have all tried to take one hill or another at one time or another. You cannot take honors from God. Instead, such honors must be bestowed by God. The author of Hebrews offers the example of the Old Testament office of high priest, of which he says, “No one takes this honor upon himself; he must be called by God” (verse 4). Indeed, in Exodus 16, when a man named Korah seeks to forcibly obtain this office when it has not been given to him, the ground opens up and swallows him and his family in divine judgment. What, then, does all this mean? In the words of the apostle Paul, it means, “Each one should retain the place in life that the Lord assigned to him and to which God has called him” (1 Corinthians 7:17). Our lives should not be marked by incessant attempts to “take hills” and obtain power. Yes, there are times when hills must be taken. Most notably, we are called in the mission of God to take the hill of hell by proclaiming the gospel to the lost (cf. Matthew 16:18). But at the same time we are called to take some hills, others are better left alone. For we are also called to be content with the positions in which God has placed us. There is no need to live our lives greedily yearning for the next hill not yet taken. For such yearning saps our hearts of thankfulness. Are you content with the hill you’re on? Or do you live your life always trying to take the next hill? Today, thank God for the hill you are on right now and seek contentment on that hill. After all, it is a gift from the One who died on a hill called Calvary. And that makes your hill a great hill, worthy of your deepest gratitude.